Holla! from the Ingressive team, I bring to you our weekly tech hubs tour. For this week, I will be taking you through Godo.ng Hub, Located at 53, Oladipo Bateye street, GRA, Ikeja, Lagos state. Godo.ng Hub is a coworking space and hub for startups,entrepreneurs, and tech Innovators. On getting to the hub, I spoke with Mr Mustapha, the Content writer and Partnership Lead for Godo.ng Hub, he gave amazing Facts about the hub and how passionate they are on supporting startups through capacity building, incubation, mentoring and resources. Godo.ng Hub has been in existence, but was officially launched in August , 2018. It was founded by Chukwuemeka Fred Agbata, generally known as CFA. Chukwuemeka Fred Agbata (CFA), through his weekly shows, titled; Tech Trends on Channels Television, ICT Clinic in the Punch Newspapers and a nationally syndicated radio show, engages individuals, startups and organisations across the tech ecosystem and beyond, on trending and important issues. 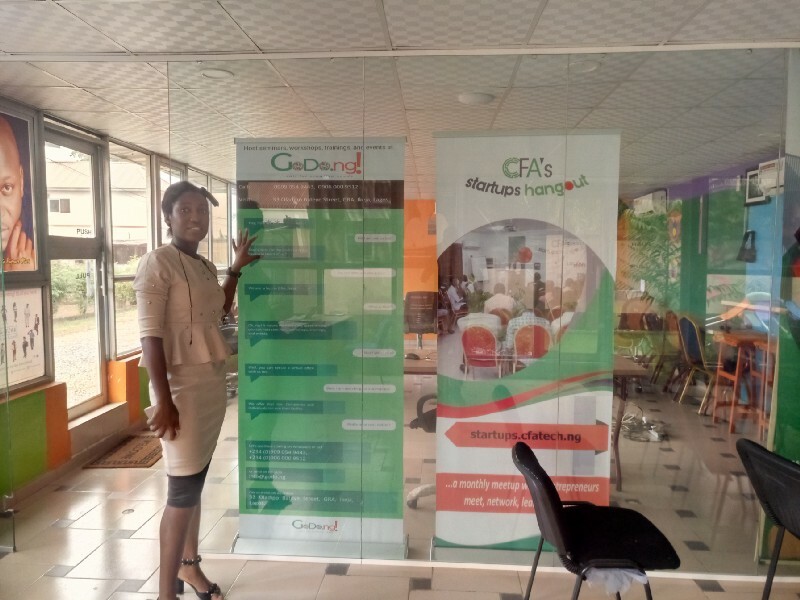 CFAtech blog, CFA’s Startups Hangout, Nigeria Int’l Tech Exhibition & Conference and much more; are examples of platforms he utilises to power a nexus on the integration and relationship of digital technology to human existence. They have an amazing work space, which makes networking with other like mind community builders easier. Another amazing fact about this hub is that ,startups who get to enrol with them, stand the chance of featuring their ideas on cfamedia.ng, CFA tech trends, as well as Pitching opportunity. Currently, they are organising tech training for kids between the age range of 6-17years old, on HTML, CSS, Scratch, and other tech tools. As one of the medium to ensure proper growth for the startups in their space, they organize a monthly meet up for startups, titled; CFA Startup Hangout; which is a platform to collaborate, share and learn from business experts, CRMs, mentors, coaches, entrepreneurs,media moguls, potential customers and many more. They also run an annual Tech Talk, called Nitda. Godo.ng Hub is a very nice place to work, meet new people and organize/hold tech events because of the ambience and space, and I must say this space is definitely one tech hub to look out for in Lagos, Nigeria. Have you been to Gododotng Hub? Do you have any tech hub you’d like the me to visit and write about? Drop your opinions in the comment. Newer PostBlockchain and Cryptocurrency; Are they practical in Africa?